Looking for the perfect personal gift idea for a young family or the grandparents?! Look no further. 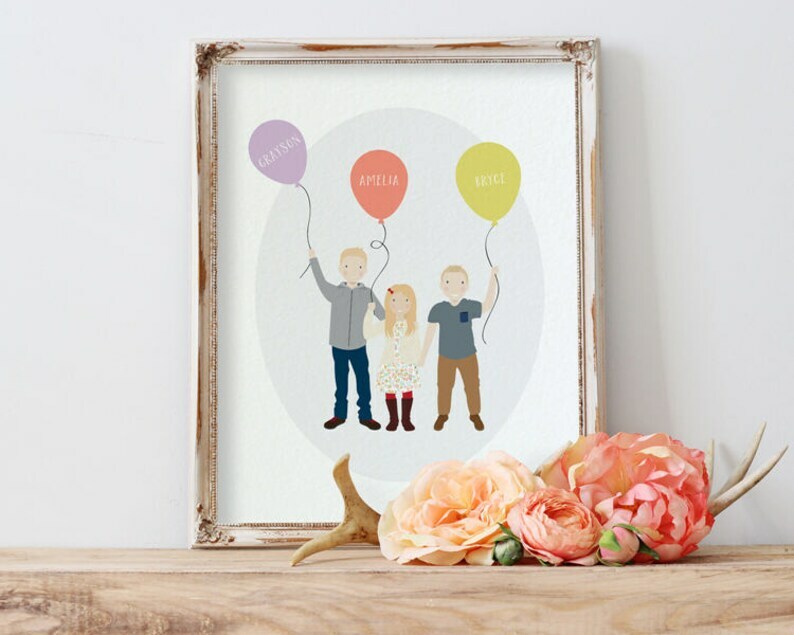 A fully custom portrait illustration is totally unique and will be treasured forever! This one features children holding balloons! 1. Pricing is based on number of people/pets. Simply choose from the drop-down menu. 2. Send a convo message with a photo(s) of all the people/pets to be included - everyone doesn't have to be together in one photo. Please specify if you have any special requests. 3. Wait at least 2 weeks (i'm very busy at the moment!) for a digital proof to arrive in your email inbox. You may change any of the appearance attributes at this point. 4. When you tell me you love it, I will either send you a print-ready PDF or printing will begin. ***Note: While these portraits are totally custom and meant to look like the people pictured specifically based on their appearance attributes, they are only intended to be whimsical likenesses of them and/or their pet and an affordable alternative to realistic portraiture. HOW MANY PEOPLE/PETS CAN I INCLUDE? IS A PRINTABLE/DIGITAL VERSION AVAILABLE? Yes! If you do not purchase the Print Add-on with this listing, a digital print-ready PDF only will be sent. Really great! The final product is so cute. The artist is great to work with. Very satisfied! Thanks!